Saturday*: 8:00 am - 2:00 pm *2 Saturdays a month. Call for availability. Dental implants have quickly become the gold-standard in tooth replacement solutions. They are the only option that replaces both the roots and crowns of missing teeth, restoring every part of the smile and closely mimicking your healthy smile. San Antonio dentist, D. Michael Miller, DDS, has years of advanced training and experience in the planning, implant placement, and dental restoration process. If you’re interested in learning more about this advanced treatment option, contact our San Antonio dental office to schedule a tooth replacement consultation today. Before we begin the dental implant supported tooth replacement process we’ll carefully assess your oral and overall health, discuss past and current health conditions and medications, and capture diagnostic images to create a precise implant supported tooth replacement plan. 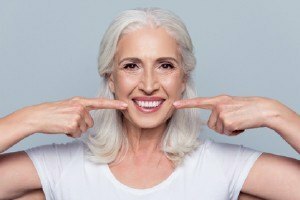 In order to ensure you have the best chances for successful dental implant placement, we may need to provide one or more preparatory treatments, including tooth extractions, tissue grafts, and services like gum disease treatment to help patients achieve optimal oral health before starting the tooth replacement process. Once we have prepared your smile and fully planned your dental implant procedures, we can schedule the surgical placement of one or more dental implant posts. Once you’re in good oral health and all preparatory treatments have been completed, we’ll surgically place the dental implants. This process is not as invasive as you may think. We simply make a small incision in the soft tissue and place the implant post into the jawbone. Then, a protective cap is attached over the top of the dental implant to protect the surgical site. 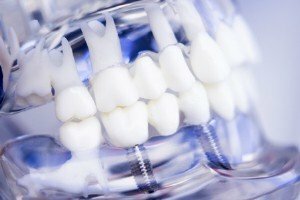 This allows the implant to fuse with the jawbone and maintains space in the soft tissue that is necessary to access the implant after it fuses with the supportive bone and soft tissue. Over the course of three to six months, the implant posts undergo a process called osseointegration. This is a long word that essentially means your implant posts integrate with the rest of your healthy dental structures, recreating your lost tooth roots. Once the dental implant posts have fused with supportive structures and the surgical site has healed, we’ll place the abutments. These are connector pieces that attach the dental implant posts to your replacement crown, bridge, or denture. After placing the abutments, we’ll capture bite impressions and design your replacement tooth or teeth. These replacement teeth may be a single tooth dental crown, a consecutive tooth bridge, a partial, or a full denture. Finally, when we receive your custom crafted dental restoration from the lab, you’ll return for the final stage of treatment. This process is simple. We check the fit of your prosthetic. Then, it’s attached to the abutment posts where it will seamlessly integrate into your smile. 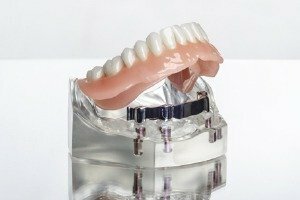 Once in place, the implant supported dental crown, bridge, partial, or full denture will remain in place and flawlessly functional for years to come.